Warren Buffett: "Berkshire's job is to perform in a manner that will cause manufacturers to welcome further purchases by us." With Berkshire Hathaway Inc.’s purchase of the Van Tuyl Automotive dealership group materially complete, Warren Buffett already is looking toward how to expand his company’s dealership holdings. His aspirations for growth are big. In his annual letter to shareholders, released on Saturday, the Berkshire Hathaway CEO talks about buying more dealerships and expanding the company’s auto retail business to many times the size of Van Tuyl alone. He notes there are around 17,000 dealerships in the U.S. and that ownership transfers always require approval by the relevant manufacturer. In the letter, Buffett described Berkshire Hathaway’s purchase of Van Tuyl Automotive as being recently completed. “And we are now ‘car guys,’” Buffett wrote. While the deal is materially complete, Automotive News has learned from two sources that some loose ends remain to be completed before the transaction is formally finalized. One source close to the deal said there were no material issues and there were “never any indications by any manufacturer” that they opposed the transaction, but it is a time-consuming process to formally close such a large transaction. The official closing is expected soon, likely in the next few weeks. When the acquisition was announced in October, Berkshire Hathaway and Van Tuyl said the deal was expected to be completed by the end of the first quarter of this year. A phone call and an email to a spokeswoman for Berkshire Hathaway were not immediately returned. 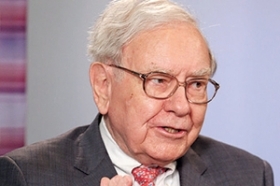 Buffett noted that the acquisition of Van Tuyl gives Berkshire 9½ companies that would be listed on the Fortune 500 if they were independent.